Barclays Research recently released a survey which was highlighted over at Zero Hedge. Apparently, investors in the survey seem to think that an Obama victory will more likely result in a stocks selling off, while a Romney win would result in an increasing stock market (as seen in the chart below from zero hedge). The most interesting part of the above graph is how FEW see a sell-off under Romney. There seems to be this odd belief, despite the facts, that Republican policies are better for markets. However, history would say otherwise as the chart below shows from CMC Markets going back to 1900. The stock markets have returned an average annual return of 15.31% with Democrats vs 5.43% with Republicans. Now some may correctly point out that Republican policies have changed over this long time-frame. However, the trend holds over the last 50 years as well as this chart from Janus Funds highlights (link is to their white paper: Market Performance and the Party in Power). 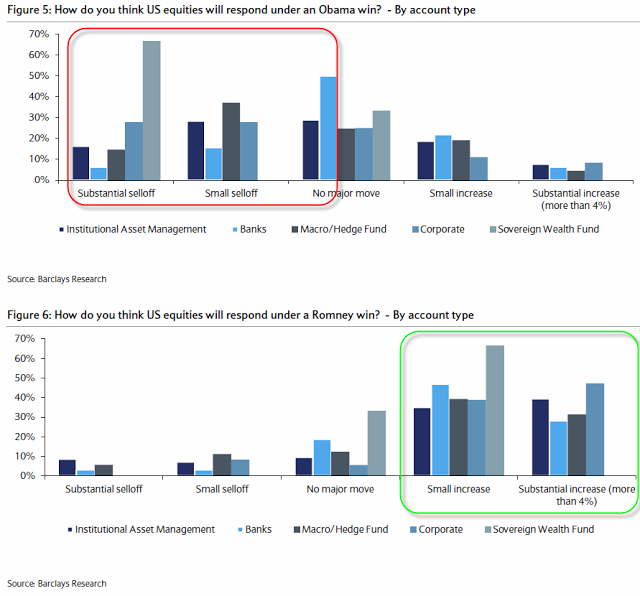 Furthermore, the Barclays survey also highlights how investors think the BOND markets would initially react to a Romney win.....yep they think bonds would sell-off. Granted the question only refers to the "knee-jerk" reaction, but again, why would the market react this way when history has shown that the BOND markets are what actually has done better during Republican presidencies? This is also illustrated by the Janus Funds paper as seen below. Clearly it is bonds NOT stocks that have done better under Republicans. I think Jeremy Grantham may have addressed investors misguided belief best in a recent interview with Charlie Rose.